Home → Discovering Montpellier France → The Tea Party – every Month including March! We have an expression in English about being ‘as Mad as a March Hare’. This comes from an old proverb about the way Hares behave at the start of the breeding season. It was made famous though in Lewis Carroll’s ‘Alice in Wonderland’. 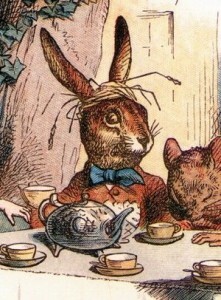 That particular March Hare always behaved as if it was tea time, which is why the Month of March makes me think of tea, (not that I need any real encouragement to consume tea). Yes, tea is of course a very popular pass-time in my home country, England. At the French American Center Tea time is not just in March, it’s every Wednesday from 16h to 18h. As we say in English it’s every Wednesday ‘come rain or shine’ in the spring and summer our weekly tea party takes place outside on the terrace, the rest of the time, in our library room. We provide the tea and cakes and you provide the conversation! So, how can you make this event not only pleasant, but also useful? My advice would be as follows; Take a phrase book or small dictionary with you, to refer to when you can’t think of a word. Bring a little note book to write down new words you learn in the course of the conversation. Be strict with yourselves about never speaking French if you are French or English if you are Anglophone. Think about possible subjects of debate or discussion, or bring photos, articles or books that you can show to the others and use as a basis for discussion. We are thrilled that there are so many of you each week and are very happy to welcome you! Enjoy your tea! Enjoy March!